For centuries, Peruvian locals have talked about a river in the Amazon that burns so hot it can kill. According to legend, Spanish conquistadors foolishly ventured into the rain forest in search of gold, and the few men that returned told stories of poisoned water, man-eating snakes, and a river that boiled from below. For Peruvian geoscientist, Andrés Ruzo, the myth had fascinated him since childhood. 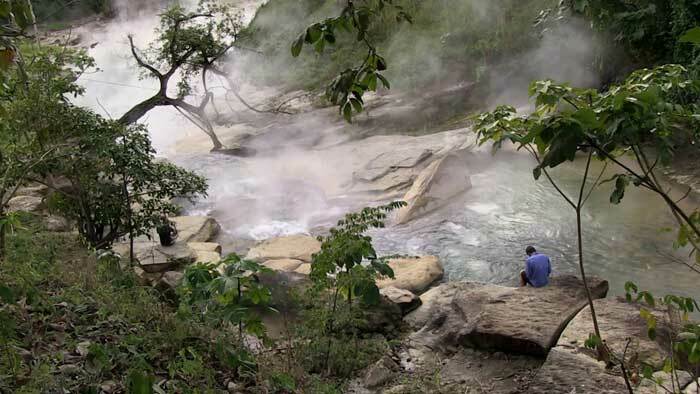 But it wasn't until he was completing his PhD project on geothermal energy potential in Peru that he began to question whether the river could actually be real. According to the experts he spoke to, the answer was a unanimous "no" - after all, hot rivers do exist, but they're generally associated with volcanoes, and there are no volcanoes in that part of the country. But when Ruzo went home over the holidays and asked his family where the myth had come from, his mother told him that the river didn't just exist, she and his aunt had actually swum in it before.